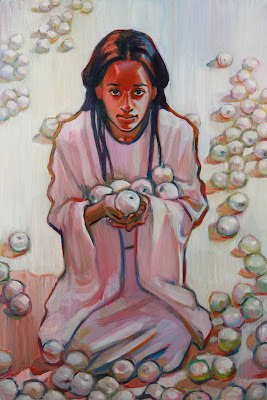 White Apple Gatherer, oil on canvas, 2' x 3,' 2010.
beautiful art, so excited to find an LDS artist. Saw your profile on mormon.org. Very nicely done. LOVE your work. 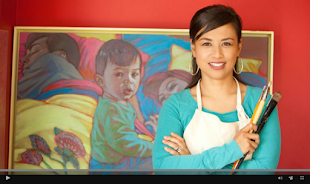 I am an interior designer and love the vibrant colors in many of your works. You have such a fresh take on gospel art. I will save my pennies for one of yours and keep you in mind for my lds clients. Hello, Rose. Our daughter, Fekirte, was the model for this painting. Will the White Apple Series be for sale when it's done? I would hate to have it slip through our hands. You caught her so exactly. I was tingling. It's beautiful. I saw your 'commercial' and wanted to see more of your work. It's beautiful! You brought tears to my eyes with "Patterns". Thank you for sharing your talent. I was blessed to here your testimony through a link in Facebook. 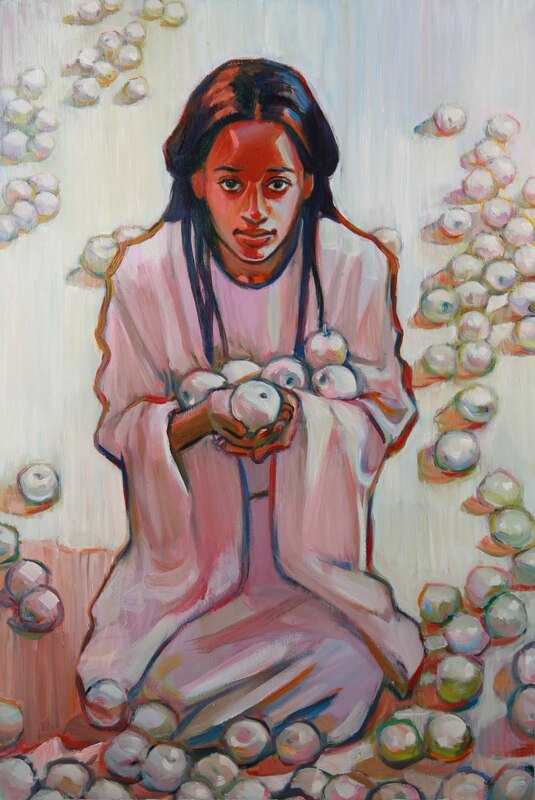 How wonderful to find another LDS artist. Your work is wonderful and your testimony shows in your work. Thanks for sharing. I love the Adam & Eve series and more.Thanks again. I really like this one, Ro! Really good composition. Thank you so much for the very kind comments. I am near speechless to know how to respond to everyone's very generous comments. I am touched that you would take the time to write. Thank you so very much.